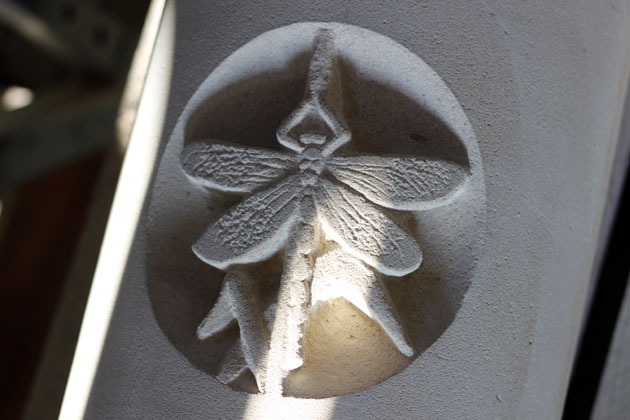 Work in progress on a Banded Demoiselle carving in sandstone. The sun shone into the workshop in slivers, landing on the stone, as if come to warm up my work. Damselflies love to bask in sunshine and can often be seen sunbathing in the early morning on a stalk, rock pile or bare earth. Damselflies can also do something similar to shivering when they get too cold, which is known as wing-whirring – they vibrate their wings, perhaps to warm up their wing muscles just enough to fly. In my carving the Banded Demoiselle might actually be coming to roost, which they do in dense vegetation, perching with the abdomen alongside a stem.